The HP Deskjet 600 is a reliable entry-level printer capable of delivering good quality monochrome and coloured prints. The dependable HP 600 Deskjet has a maximum duty cycle of 1000 pages and can handle 100 sheets at a time. The maximum print resolution is 600 x 600 dpi. The HP Deskjet 600 is offered at a cheap price and it has generally low printing costs. Print speeds are sluggish and this printer only has a parallel port for connectivity. Small offices and homes favour the HP Deskjet 600 for its compact size. It weighs 5.3 kg and has dimensions of 436 x 405 x 199 mm. Print speeds can go as fast as 4 ppm for black and 1 mpp for coloured with the Deskjet 600 printer series. The HP Deskjet 600 can print on paper, envelopes, and cards plus labels and it has a 100-sheet input paper tray. The Deskjet 600 inkjet printer is very affordable and its running costs are reasonable. It delivers good quality coloured and black and white prints. The HP Deskjet 600 colour printer is also extremely reliable and has a 60,000 page life. 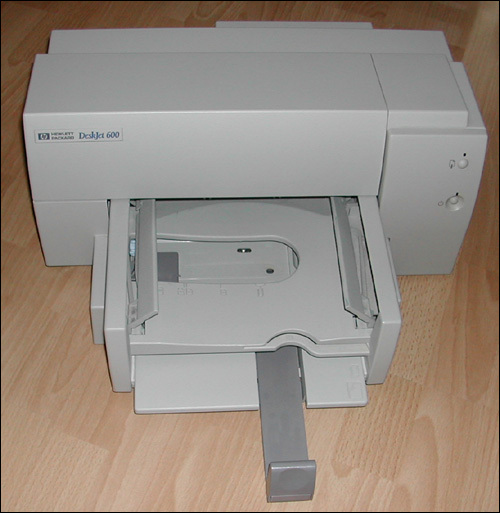 Macintosh computers are not compatible with the Deskjet 600 printer; some newer operating systems of Windows cannot work with it, too. Print speeds are very slow, and the HP Deskjet 600 can only print on a limited type of media.